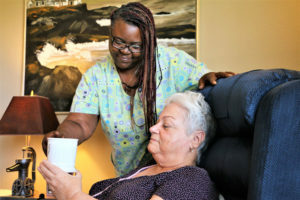 At Montebello Home Care, we know that navigating the world of Southeast Texas area senior home care services and finding the information you need can be challenging, and we’re devoted to helping families solve problems. That’s why we’re dedicated to being a local resource for Beaumont, Port Arthur, Lumberton and Nederland TX senior care home health care and aging questions. Here you will find links to senior care organizations that we think will find helpful in your search for at home senior care. Click each title to view these websites. Accrediting Commission for Health Care, Inc. Whenever you need help finding Beaumont TX senior care services, or services throughout Jefferson, Orange, and Hardin Counties, Montebello Home Care is always happy to help. Give us a call any time at 409-276-7576 or feel free to contact us online. ©2017 Montebello Home Care. All rights reserved. Materials may not be used without written permission. Most of the photos you see on this site are of real Montebello Home Care clients and caregivers.